Albany Roundtable: RSVP Deadline 5/13 for "An Evening with Janet Flammang"
RSVP Deadline 5/13 for "An Evening with Janet Flammang"
Janet Flammang, author, professor and chair of political science at California’s Santa Clara University, will be the featured speaker at the Albany Roundtable’s Annual Meeting on Wednesday, May 18, 2011. The event is open to the public, and will be held at the historic University Club of Albany, 141 Washington Avenue at Dove Street. The reception will take place from 6:00 – 8:00 p.m., and will feature a social hour with cocktails and hors d’oeuvres, a short update on the Albany Roundtable Civic Luncheon Series and a presentation by the visiting speaker. Tickets are $30. 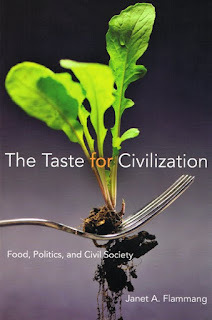 Janet Flammang is the author of The Taste for Civilization: Food, Politics and Civil Society, (Champaign, IL: University of Illinois Press, 2009.) The book explores the idea that table activities – the mealtime rituals of food preparation, serving and dining – lay the foundation for a proper education on the value of civility, the importance of the common good, and what it means to be a good citizen. The arts of conversation and diplomatic speech are learned and practiced at tables, and a political history of food practices recasts thoughtfulness and generosity as virtues that enhance civil society and democracy. In our industrialized and profit-centered culture, however, foodwork is devalued and civility is eroding. Janet A. Flammang teaches courses in U. S. politics with an emphasis on women and politics. Her current research explores the relationship between meals, conversation, community and democracy. She is the author or editor of books and journal articles on women’s politics including Women's Political Voice: How Women Are Transforming the Practice and Study of Politics. The Albany Roundtable’s previous Visiting Speakers have included Colin Beavan (No Impact Man), Jaime Correa (planner, architect and professor at the University of Miami); Stan Eckstut (NYC architect, Battery City Project); Tony Hiss (Project for Public Spaces); Robert McNulty (Partners for Livable Places); Paul Pritchard (National Parks and Conservation Association); Richard Bradley (proponent of Downtown business districts); Ray Oldenburg (The Great Good Place); James Howard Kunstler (author and new urbanist); Jane Holtz Kay (architecture critic, author of Asphalt Nation); Joseph P. Riley (Mayor, Charleston, South Carolina); Richard Reinhart (Buffalo Place); and others. Tickets for the reception must be reserved by Friday, May 13. For more information, visit www.albanyroundtable.com, email albanyroundtable@yahoo.com or call the University Club at 518-463-1151. Click here to download and print a PDF flyer with clip-off RSVP form.